Who here loves Harry Potter? I sure do, but even if you scoff at the book series, you probably have still heard of the wizarding sport Quidditch. But Quidditch is no longer only an invention by J.K. Rowling, safely tucked within the pages of a few novels—it has made its way into the real world. It is played at the collegiate level and worldwide, and there are even some high school teams. It draws in Harry Potter fans, athletes looking for a new and interesting sport, and others who’ve stumbled upon it during Orientation, or were dragged to practice by their friends. You know who you are. 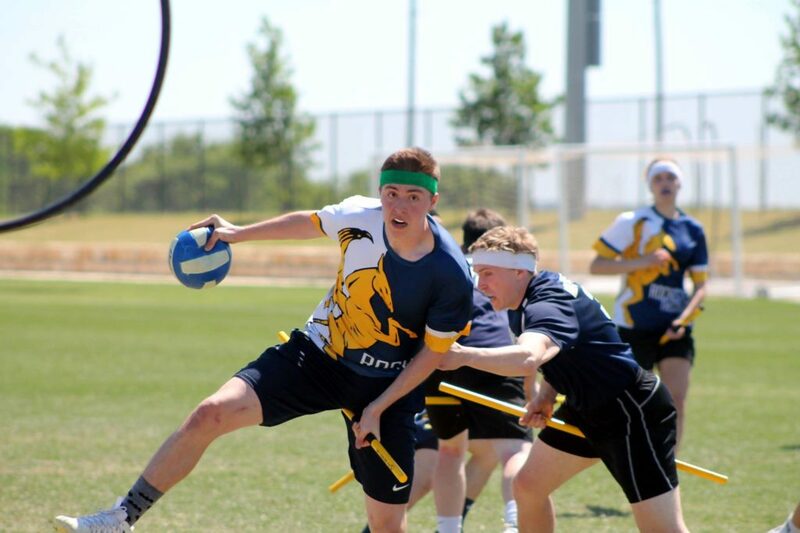 This year, Quidditch became part of my life here at the University of Rochester. And I am so grateful that it did. Muggle, No-Maj, or college Quidditch is very different from how it appears in Harry Potter, from rules to uniforms (robes would be a little cumbersome). The Quaffle is actually a volleyball, and the field is rectangular, not oblong. Bludgers are represented by dodgeballs and there are three of them instead of two. We also just chuck them at people, no bats involved—hey, there have got to be sacrifices when your equipment doesn’t have sentience! Of course, it’s a given that there is no flying, so players run around the field with broomsticks tucked between their legs. Do you get used to it? Surprisingly quickly. Do you look silly? Absolutely, but so does everyone else on the field. But the one element that everyone fixates on is the portrayal of the golden Snitch. The Snitch is played by an actual person wearing yellow (in fact, there are regulation Snitch shorts) who runs around the field being chased by Seekers. Student Tim Kwan says, “Some people hate the Snitch because it’s so unpredictable. It’s hard to strategize around because it’s literally another person. But I think it adds to the spectacle.” Following? If you aren’t, it’s okay—it took me at least a few weeks to grasp the basics. There are still times when I have to ask more senior players on the team for clarification (thanks, Alex). So what compelled me to join the team here at Rochester? I actually played my first game more than a decade ago, all the way back in elementary school. This was before the sport was organized and regulated, and wasn’t much more than a bunch of girls running around in a backyard, chasing someone’s older sibling in yellow tights. But that was so long ago that it didn’t really affect my choice to join. I had a few friends on the team who really enjoyed it, but they weren’t the deciding factor either. The real reason is because last year, Rochester’s team, the Thestrals, went to the National Championships . . . and won. When I heard that I was a little starstruck (I came from a school without a significant sports presence). But although that was why I got into Quidditch in the first place, it isn’t why I stayed. I stayed because I totally fell in love with the game. Quidditch is a coed, full-contact sport with players that can span almost a full decade in age range. Watching a game is an experience like no other. Your eyes can’t shift from the Quaffle play to Beater battles to the Snitch fast enough to make sense of it all. I can honestly say it is like nothing I have ever seen or done before. It is highly organized chaos, and I love it. This kind of exposure allows for more variety in strategy then say, baseball. Rule changes are happening every year, and a tactic that wins your team every game one year may very well be illegal the next. There are captains and coaches that have been playing longer than the folks reffing the games. Kwan adds, ”the rules change so much that newer players aren’t at too much of a disadvantage.” So you have no reason not to try it out! One downfall is that people don’t always take us very seriously; I’ve heard “Quidditch isn’t a real sport” more times than I can count. It’s true that we aren’t in any conventional sense, but all the running up and down the field, picks, passing plays, tackling, chucking balls around the field, and chasing them down over and over often drives us to exhaustion. So to anyone who says it isn’t a sport . . . well, I would like to see them try their hand at it. The season may already be half over (we play all year), but we still have plenty to look forward to. This year, we already tackled the northeast regional championships, and we’re getting ready to head back to Round Rock, Texas, to take on nationals for a second time. But those aren’t the only opportunities being on the Quidditch team affords you. We’ve also been interviewed on Good Morning Rochester and filmed by PBS, getting to talk about and demonstrate the sport. Aside from the regional and national championships, we compete in tournaments everywhere from next door at RIT, to Pennsylvania, Maryland, and Massachusetts. We have parties and bonding events like any other club. There’s a real sense of fun and support within the team. Even though we’re not playing at Hogwarts, that doesn’t mean you won’t find just a little bit of magic on the field.